1 The Lost Lectures. Now in print. NEARLY half a century has gone by since the passing of Walter Elias Disney (1901-66). The latest Disney blockbuster at the time was the live-action song and dance film Mary Poppins from 1964. Generations that followed probably associate the name “Walt Disney” with a massive faceless corporation rather than the beloved uncle figure who so intimately affected the lives of millions of children and parents. CARTOONS & COMICS. For six years Walt Disney was on his father’s paper route, on a bicycle from year two. He also started selling papers at a Kansas City trolley because his dad kept all the money. “The upshot of it I was working all the time. 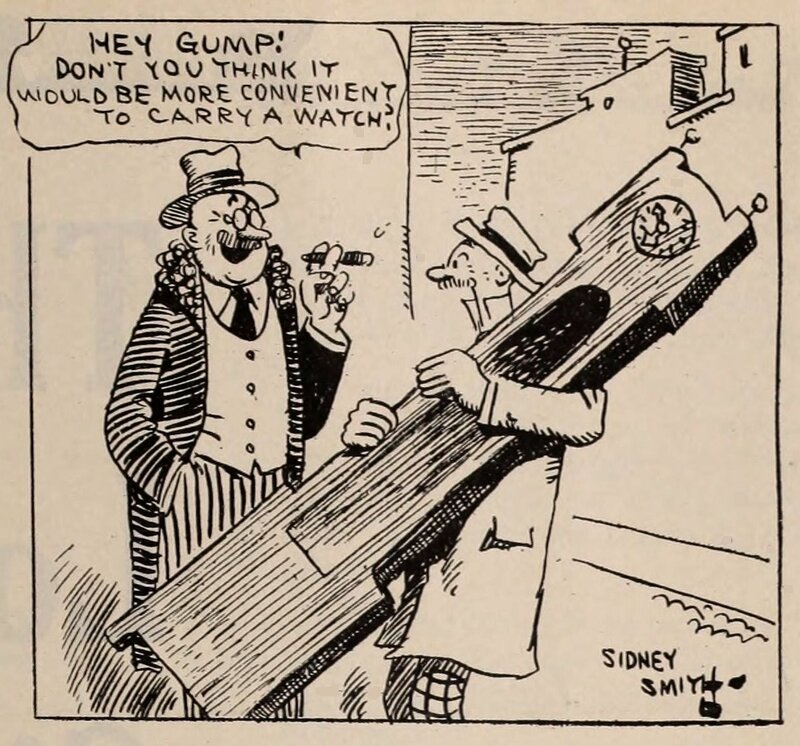 I mean, I never had any real play time.” But Walt surely had his eyes on all of the national papers and newspapers with cartoons and comics. 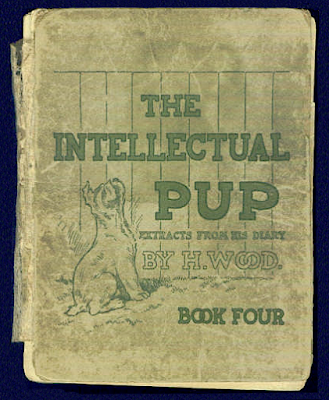 And without a doubt loved The Intellectual Pup in the Kansas City Star on Sunday by Harry Wood (1871-1943) — the cartoon adventures of a scruffy terrier and other funny dogs, in his paper since late 1907. 2 A scruffy dog. 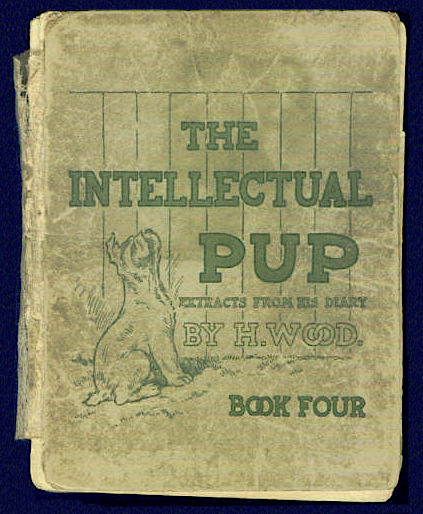 The Intellectual Pup; Extracts From His Diary by Harry Wood. In books from G.W. Dillingham Co. and the Kansas City Star since 1908. The Kansas City Star itself had a “restrained appearance” and featured practically no comic strips until the 20s. FIRST SYMPHONY. Professionally, Walt Disney began doing cartoons and animation in the early 1920s, working together with Ub Iwerks. In 1928-29, a year after the launch of Mickey Mouse, they produced a new series of animated films with sound, musical shorts under the title Silly Symphonies, beginning with The Skeleton Dance. LECTURES. 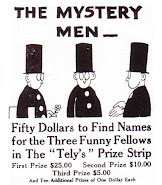 At the time Disney was dreaming of making a feature-lenght animated film and his Silly Symphonies became the petri dish fueled by innovations in technique and new technology. 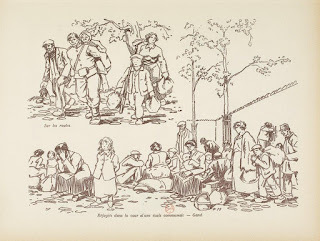 In November 1930 Canadian born Don Graham began teaching life-drawing classes on Disney’s sound stage; soon Disney artists were attending classes at the Chouinard Art Institute. In order to train the large number of recruits Disney required to make the feature Snow White and the Seven Dwarfs — first shown just before Christmas 1937 — Disney partnered with Chouinard and set up his own in-house art school. 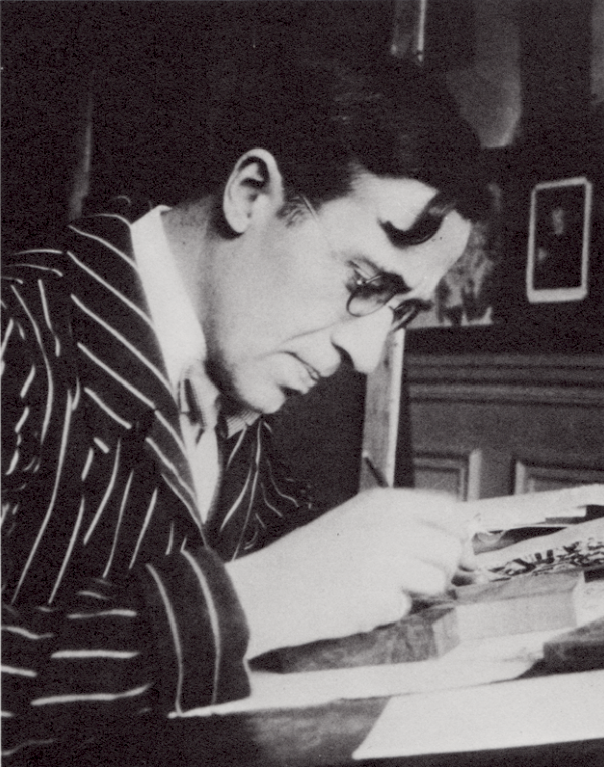 Notes were taken of the lectures organized by Don Graham in 1935-39. These notes have now been made available, their full texts nicely facsimiled as photographic reproductions of the original typewritten sheets. 3 An inspirational drawing. 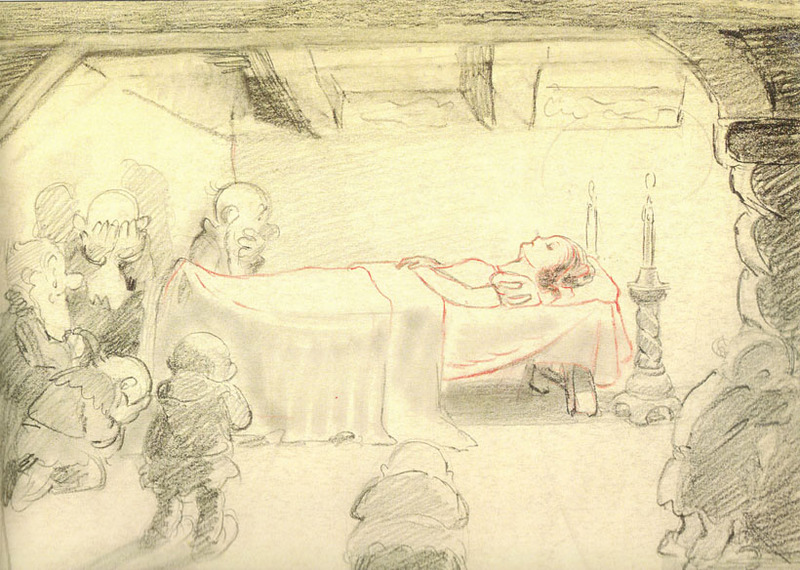 Snow White and the Seven Dwarfs by Albert Hurter, mid-1930s. RADICAL SCHOOLING. 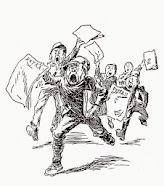 At the time the idea of a school for animators was so radical that Bill Tytla, who offers the two most incisive lectures in the book, began his 1936 speech with “I really don’t know where the hell to start.” Alexander Woollcott and Frank Lloyd Wright seemed bewildered by the subject of animation but managed entertaining and informative lectures. The student animators in turn were bewildered by the pompous labored musing of film scholar Boris Morkovin. 4 Animators on strike. 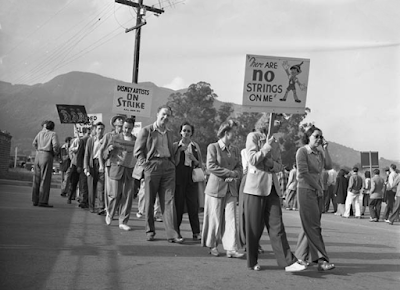 One of the strike actions of Disney animators, united in the American Federation of Labor Screen Cartoon Guild, between late-May and Fall 1941. THE END OF TIME. The animator’s strike of 1941 and World War II put an end to the “wonderful time” restored to memory by Before Ever After. Many of the techniques birthed during this period are probably redundant in the 21st century. Even so, in this digital age there is much to be learned from these historical lectures — about painting, timing, drawing and action, acting and gag-writing. 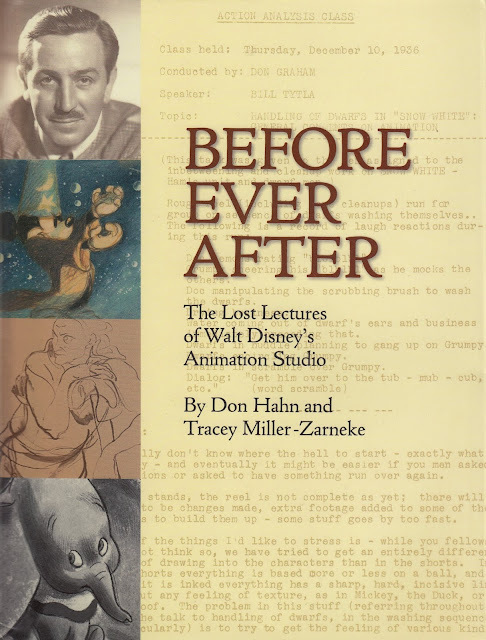 The lost lectures, illustrated by powerful archival photographs and artwork, preserve for posterity a very personal, often humorous, fly-on-the-wall viewpoint of a revolutionary period in the history of animation. Pictures  to  are not in the book. Photo  courtesy of Los Angeles Times Photographic Archives, UCLA. 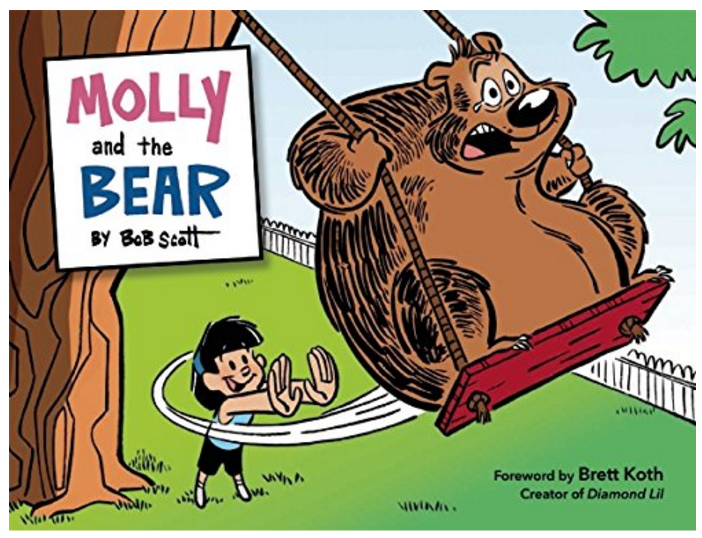 Disney artist Bob Scott announces that his syndicated webcomic Molly and the Bear will have its first compilation hardcover book published March 2016. 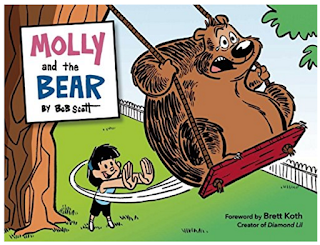 Molly and the Bear, a spirit-lifting comic strip for all ages about an 11 year old girl and a 900 pound scaredy-cat bear, is available for preorder now HERE. The strip can be read HERE. 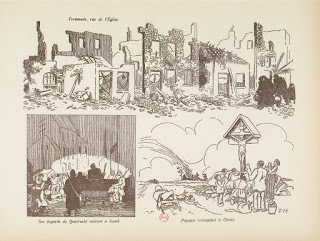 FRANS MASEREEL — world famous now for his personal woodcut style in novel form — also penned these documentary sketches of Belgian World War I refugees, published in the book La Grande Guerre par les artistes (1914-15), a book with war art by many more artists. 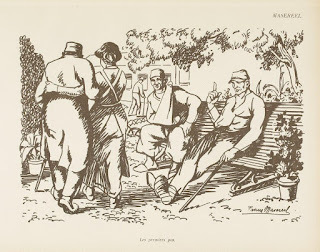 FRANS MASEREEL’s full name was Frans Laurent Wilhelmina Adolf Lodewijk Masereel (31 July 1889, Blankenberge, Belgium - 3 January 1972, Avignon, France). 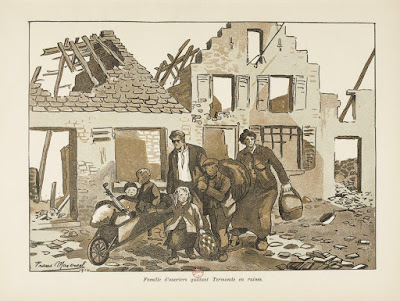 As a Belgian Dutch-speaking Belgian, Masereel was raised in Blankenberge and Ghent in the province of East Flanders. He was the son of a textile manufacturer who struck it rich, but his father already died at 47 when he was 5. 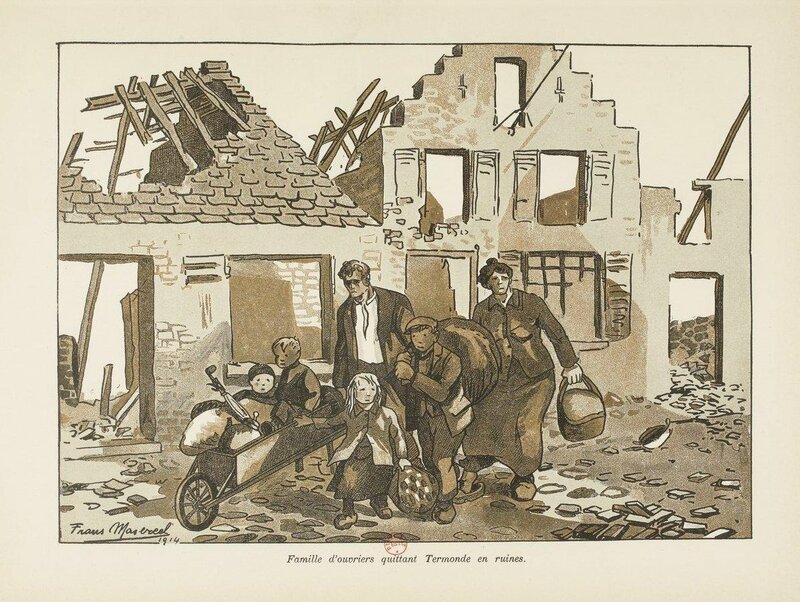 Frans grew up in wealthy circumstances with a second father who liberated his mind. 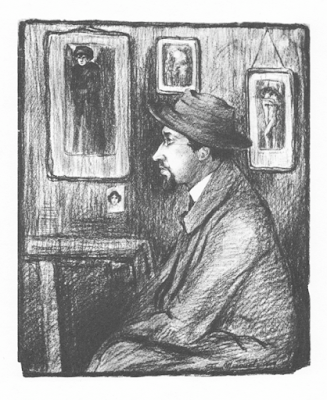 He learned French and German and began studying art. In 1907 he was advised to leave in his second year at the Academy of Fine Arts in Ghent. “You’ve learned nothing here. 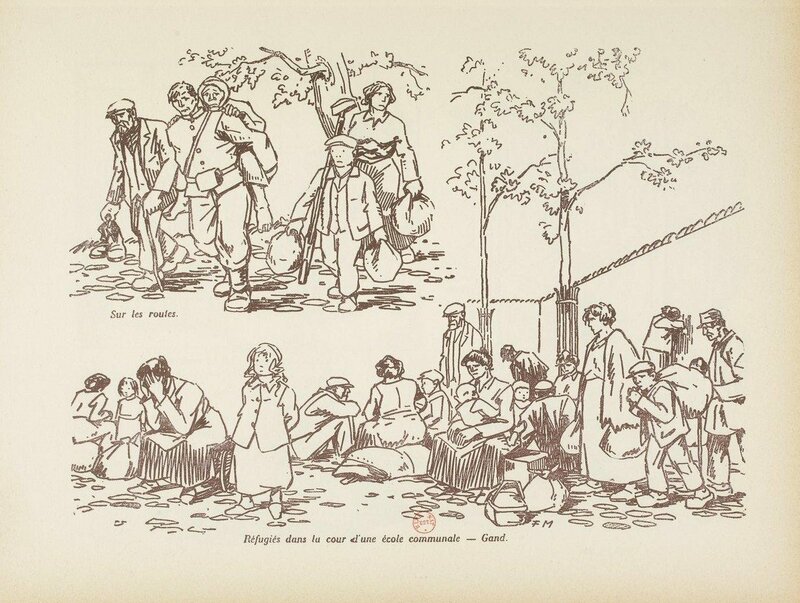 Go… Travel.” In 1910 he first took the train to Paris. 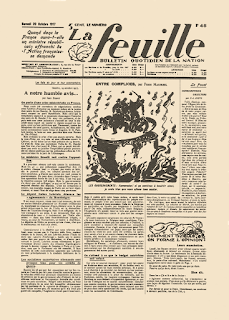 Living there since 1911 with his wife, he befriended Parisian Henri Guilbeaux, director of L’Assiette au Beurre, in the Fall of 1912, just around the time the satirical weekly was closed down. 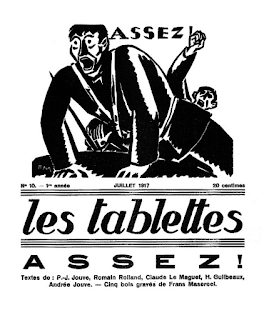 The drawings Masereel offered L’Assiette au Beurre came too late. PARIS WOODCUTS. 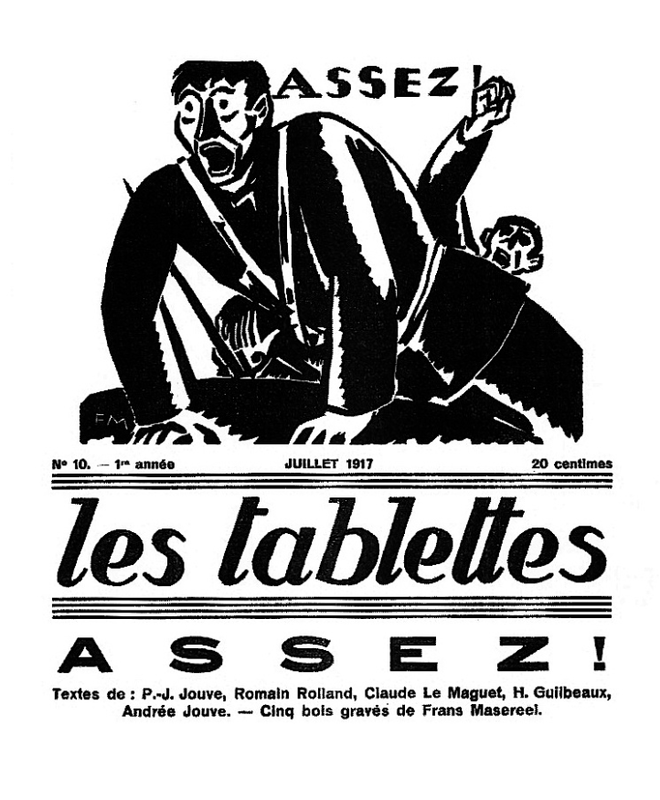 It was in Paris Masereel began making etchings and woodcuts. 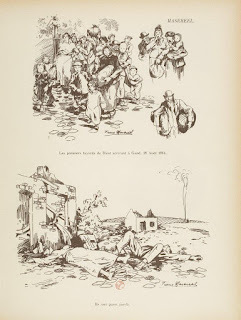 Filled with intense horror by the war of 14-18 he followed Henri Guilbeaux to Geneva, Switzerland, at the time a meeting-place of “French, Russian and German pacifists, conscientious objectors, deserters and revolutionairies of many different nationalities, but chiefly French, Russian and German.” He met many anti-war militants. 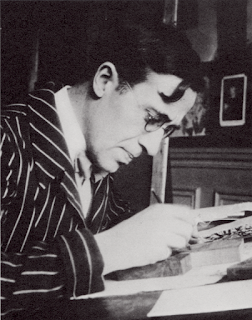 In 1915 he was a translator of letters for the International Red Cross there. 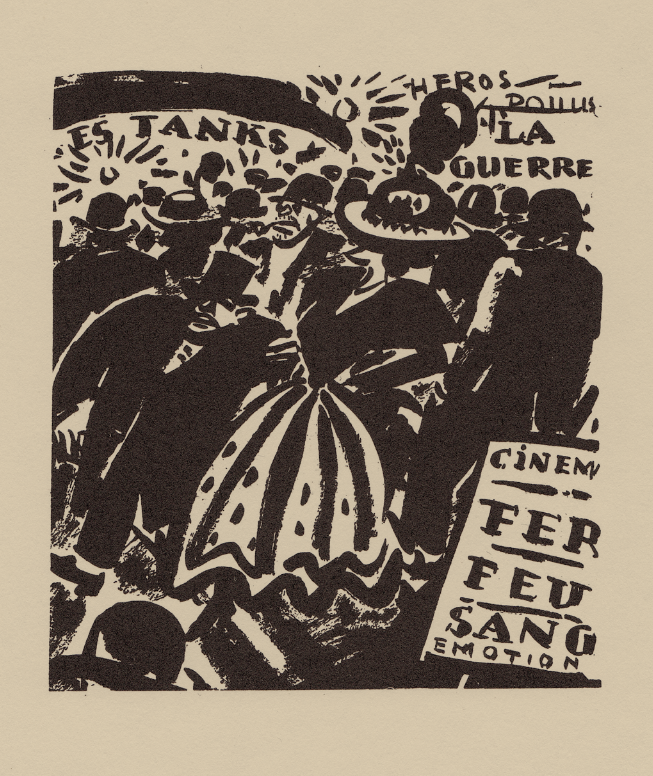 Forty-eight of his earliest woodcuts were done in 1916-19 for the monthly les tablettes (a little paper he cofounded with anarchist French workman Jean Salives, whose penname was Claude Le Maguet). BRUSH-DRAWING. Masereel’s now world famous personal woodcut style was almost immediately there, done in striking blacks and broad fields and lines. 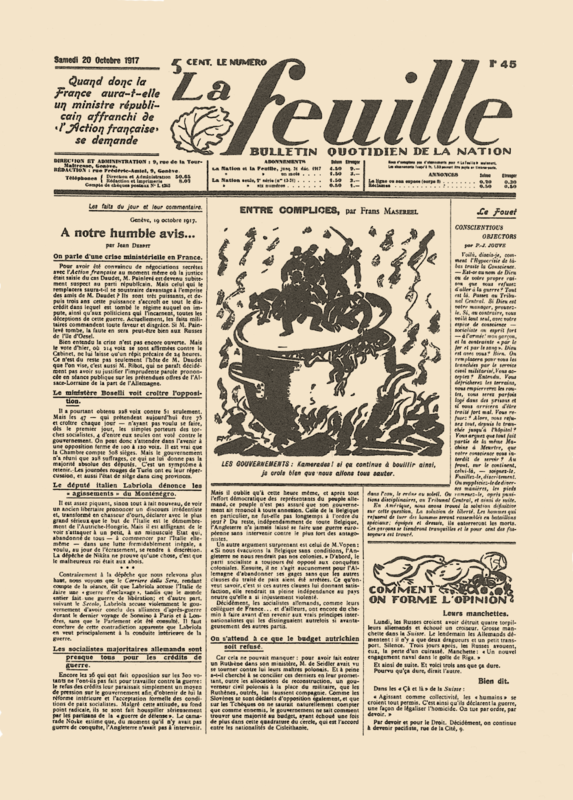 Similar Masereel visuals appeared on the front of the pacifist daily La feuille (subtitled: ‘bulletin quotidien de la nation,’ Geneva, 1917-20), executed as rough brush-drawings in Indian ink to beat the daily deadlines — most days he delivered them in time. 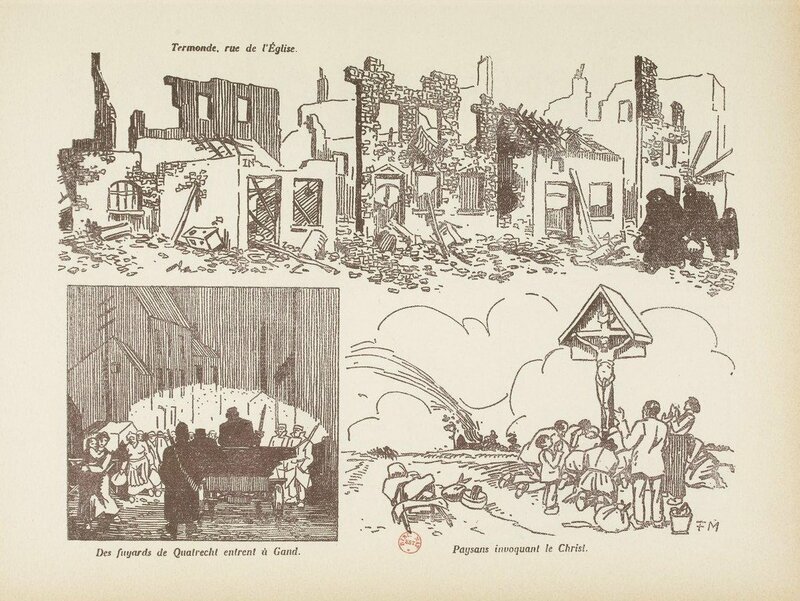 La Grande Guerre par les artistes HERE. Thanks to Antoine Sausverd at Töpfferiana. 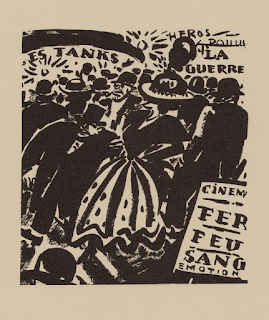 Biographical data from Roger Avermaete, ‘Frans Masereel’ (1975).